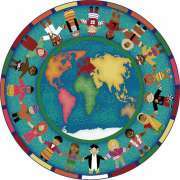 Buy Multicultural Rugs For Your School. Shop Now! 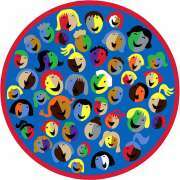 How can you celebrate diversity in the classroom? Multicultural rugs show every student that you appreciate their unique qualities. Rather than just having a few lessons on the topic, choosing a major piece of classroom furniture that celebrates diversity shows young learners how integral this value is to education every day. 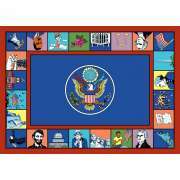 When it comes to choosing an educational rug which will likely have a prominent location in your learning space for many years, the selected design says a lot about what is important to an educator and the school they work in. A multicultural carpet will send the message loud and clear that you not only tolerate the differences among students and staff, but that it is a key component to a successful education. 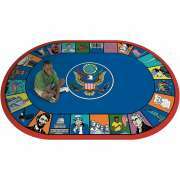 A multicultural carpet features a design which encourages young learners to appreciate and value diversity. 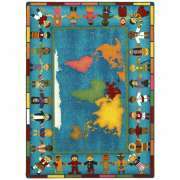 One of the most popular designs features a map of the world in the middle with children from various cultures holding hands around the border. Children will love looking at the different outfits and thinking about how they can be friends with people who are different from them. 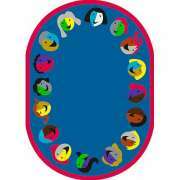 This design also offers a great way to talk about different climates and cultures in various parts of the world. Celebrating diversity isn’t just about cute graphics, it can also include language learning. 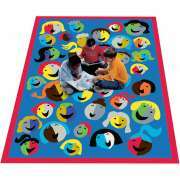 Bilingual rugs encourage children to learn languages which allow them to interact with people from various cultures. 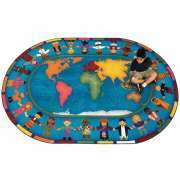 Preschool is an ideal time to start learning a second language and a carpet can be a great tool for immersion and hands-on activities. Kids can even practice themselves in their free play time when everything is laid out right in front of them on the carpet. Learning an additional language from a young age teaches children to be sensitive to the differences between people and to be aware of the importance of cross-cultural communication. What kind of rug can I put at the entrance to my classroom? While it is definitely nice to have a classroom carpet inside your learning space, you might want to consider getting a classroom welcome mat as well. 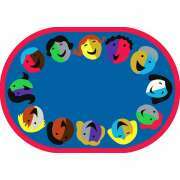 We have designs which include children from various cultures so all of your students will know that they are welcome in your learning space. Little ones will just love picking out the children that look like them and their classmates. A welcome mat is especially helpful on rainy or snowy days, so kids can wipe off their shoes without tracking mud and moisture into the classroom. Can I get multicultural rugs in different sizes? If you are interested in purchasing a multicultural carpet, you have come to the right place. We have a number of different designs you can choose from and many of them are available in various shapes. With a selection of sizes as well, you can enjoy these attractive designs in a variety of spaces including your circle time area, reading center, library and more.